WELCOME, BRAVE AND ADVENTUROUS PLAYERS! Get ready for 5 weeks of trials and tribulations here at Mystery Manor! Please take the time to familiarize yourself with these rules before participating. It would be a shame if your efforts were for naught because you didn't follow the rules! If you’re new to Mystery Manor, all you have to do is register here in the forums to play. Please note that the registration process involves responding to an email from a MM administrator, so don’t wait until the last minute to join us. (If you haven't heard from us 24 hours after registering, check your junk mail.) Once your registration is approved, feel free to introduce yourself in our Guest Book and to participate in any other topics that catch your interest. 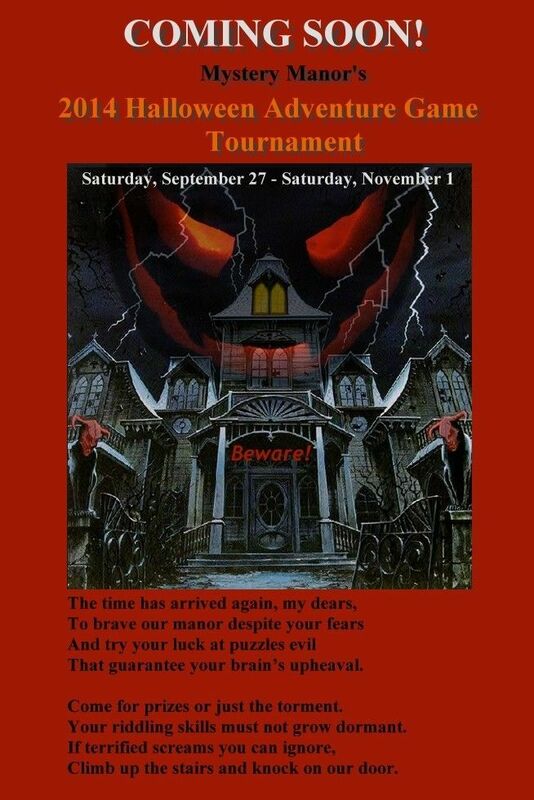 The tournament will run for 5 weeks beginning on Saturday, September 27 and ending on Saturday, November 1. Each week you will have 2 regular puzzles or one multi-part puzzle to solve, plus there may be another special puzzle for you to figure out during the course of tournament. You’ll get more details about this on the starting day. Each week's new puzzles will be posted on Saturday around 9:00 PM Central Daylight Time (CDT), which is Greenwich Mean Time (GMT/UTC) minus 5 hrs. 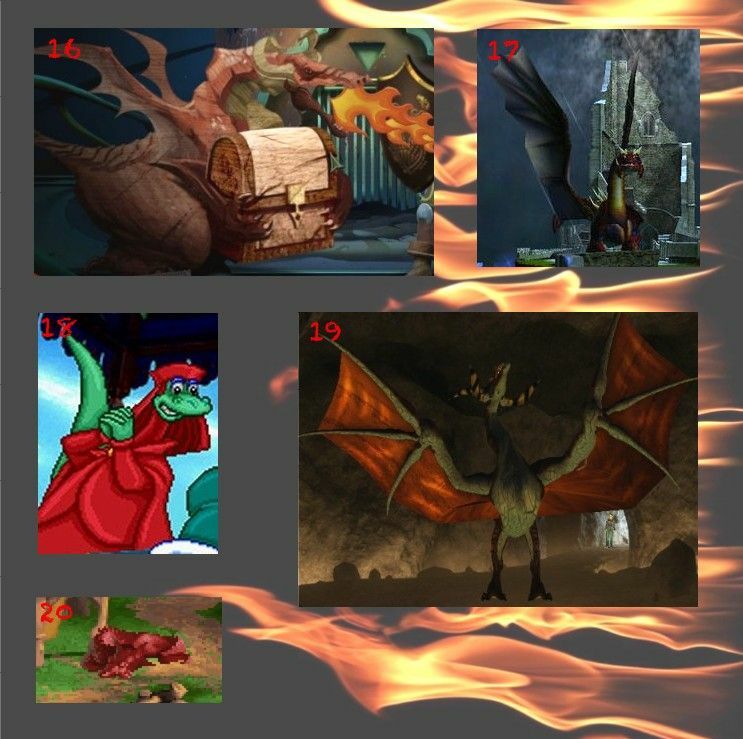 Guesses for the week’s puzzles will be accepted until 9:00 PM CDT the following Saturday. 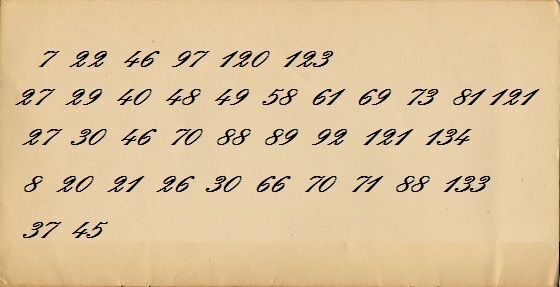 The answers to the puzzles and the scores will be posted soon after. If you want to set the time zone to CDT, check under preferences in your user control panel. If our website's server goes down, the puzzle time limit may be extended, especially if it affects the end of any week of the tournament. All puzzle threads will be locked to avoid the accidental posting of answers for all to see. There will be a thread for general questions and comments in the tournament section, but please be careful not to post any hints there or anywhere else in the forums. If you do, you will be disqualified from playing for that week. When in doubt, direct your questions to me or one of my hard-working slaves (aka moderators or administrators) via PM. Your guesses during the tournament must be sent by Private Message (PM) to me, Quizmaster. Please don’t send any answers to anyone else on the staff, unless you are specifically directed to do so in the individual puzzle rules. You should receive a response within 24 hours. If not, please let me know. There are many different types of wicked puzzles in our tournament, and a variety of scoring methods will be used. Please read the directions for each puzzle carefully. If they aren’t clear to you, contact me for clarification. If something needs explaining or correcting, I will post it in the tourney discussion thread, so check there frequently. When submitting your guesses, please try to group your answers to limit the number of PM’s you send each day. It keeps me from biting my claws and ruining my lovely manicure. Also, please put the puzzle name in the subject line. When submitting answers for both puzzles at the same time, please label them in the body of your message. 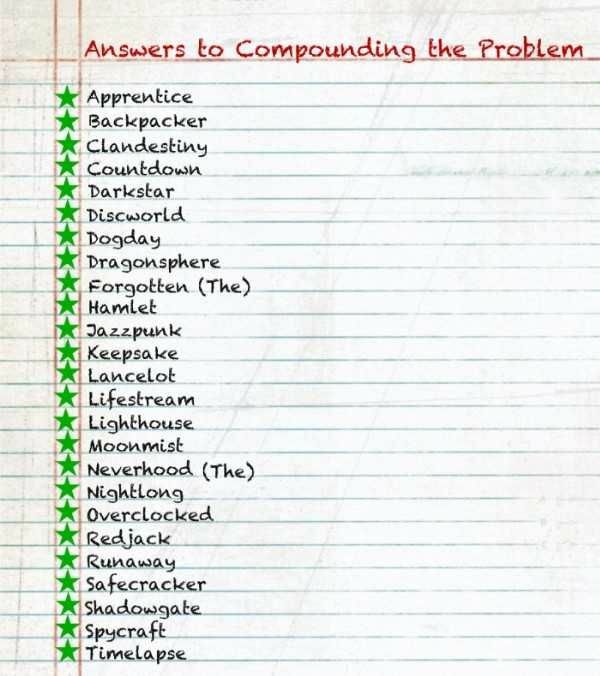 If your answer is the name of a game, please make sure it’s complete. If it is one of a series, make sure you identify it with a number or the complete subtitle. If you just give the name, it will be assumed that you mean the first one in the series. Also, sometimes spelling does count, so check each puzzle's directions carefully. 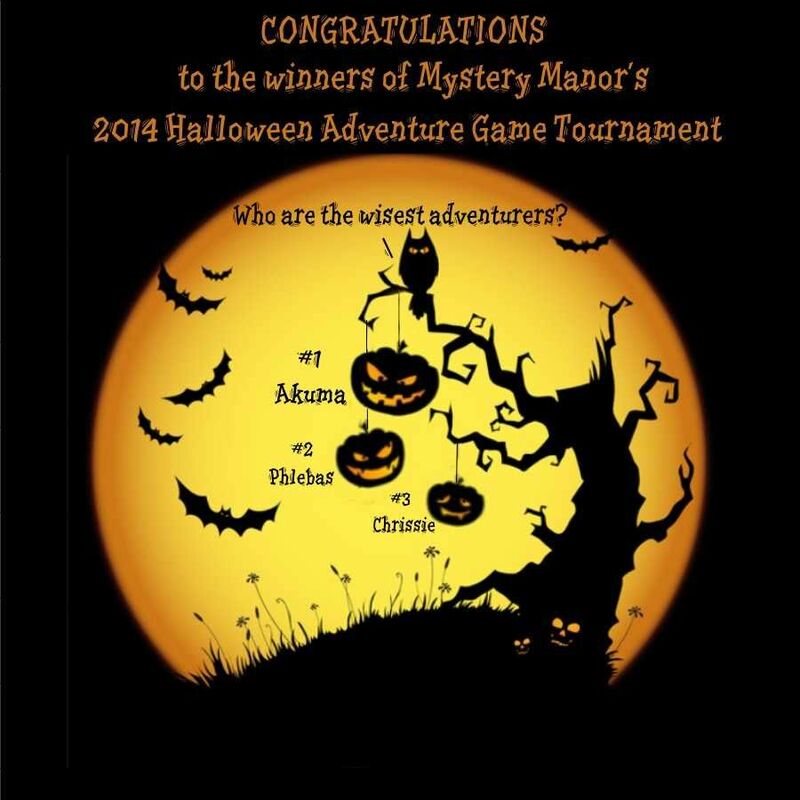 Adventure games for the PC and/or Mac as well as the occasional console adventure will be used in this tournament, but be aware that this covers a broad spectrum and may include adventure games with some action or RPG elements, puzzle-heavy adventures, text adventures, and/or children’s adventures. Indie-made, freeware, and fan-made games may also be included. Most of the games used will have an English version. The few that don't will either be known by their English titles or can be played with English subtitles. 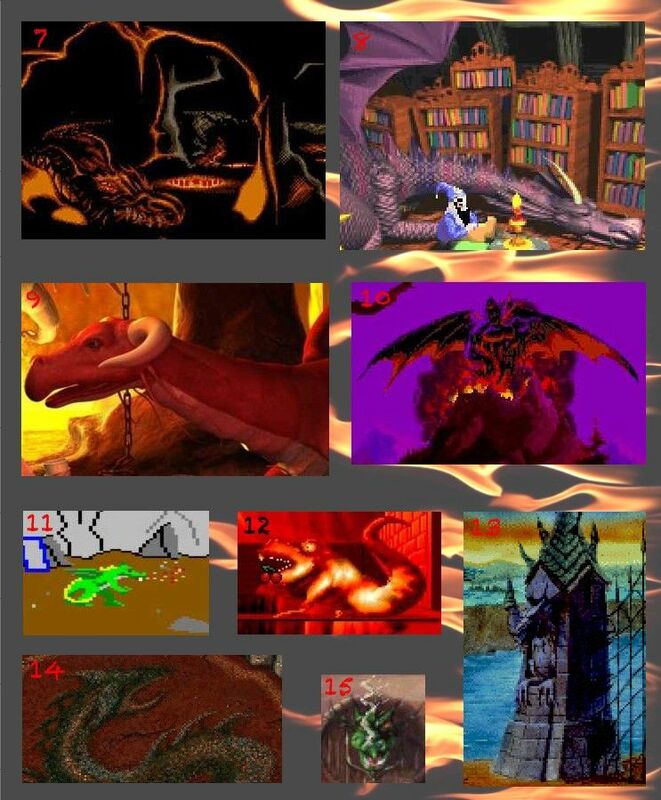 The screenshots used in some of the puzzles usually come from regular gameplay, but cut scenes, loading screens, and box shots also may be used. The prize for each of the top three scorers of the tournament will be the player's choice of a new game. In addition, a consolation prize will be drawn from the names of those not in the top 3 places. To qualify for this drawing, a player must participate throughout the tourney. Good luck and happy hair-pulling to all our players! Each answer is worth 10 points for a correct first guess, 8 points for a second, and 6 points for a third, making a maximum of 250 points. Please alphabetize your answers and get them to me by 9:00 PM Central Daylight Time on Saturday, October 4. I'll be waiting with my red marking pencil. I hope it gets lots of use. Pay attention, class! 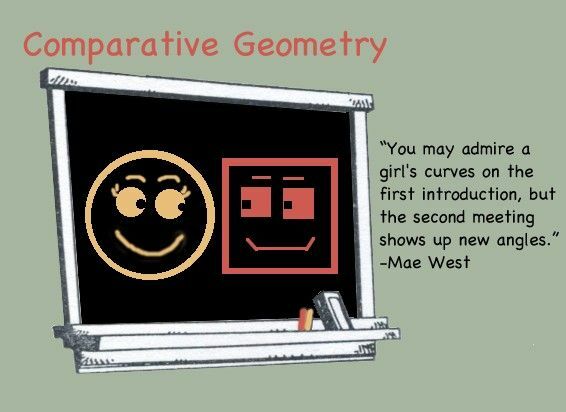 Let's not go off on a tangent! 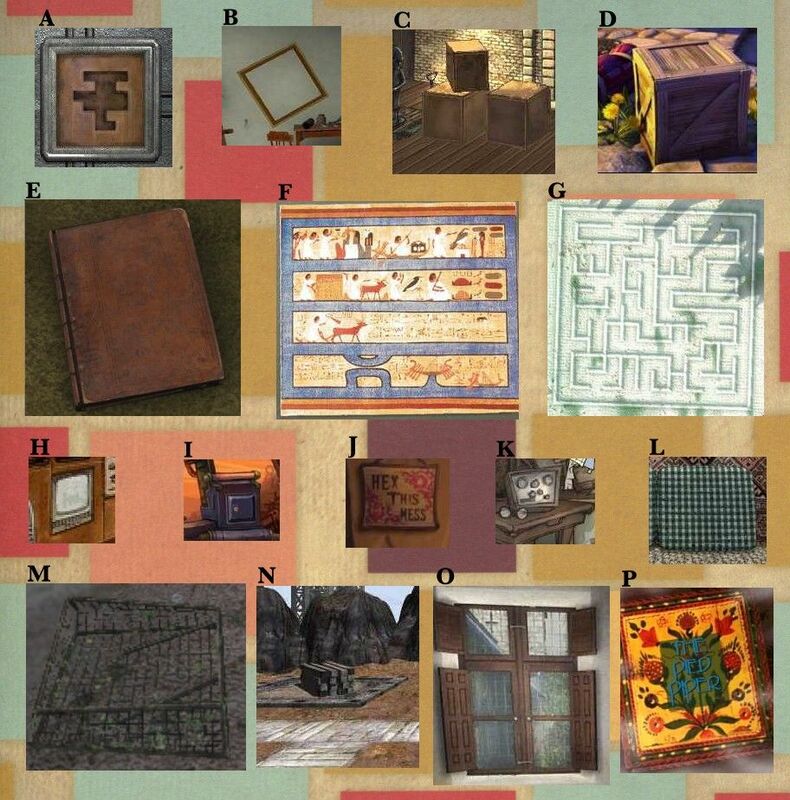 The first set of pictures has items with curves from 16 different adventure games, and the second set has items with angles from the same games. Your assignment is to match them up and tell what game has both items. You will earn 15 points for every correct first guess, 12 for a second guess, and 9 for a third. If you submit an incorrect match, that answer will be counted wrong even if one of the items is correct, so consider your choices carefully. Your answers are due in my PM box by 9:00 PM Central Daylight Time on Saturday, October 4. I was prowling around in my aunt’s attic yesterday, trying to find a clue about her mysterious disappearance last month. After returning from her big world tour, she vanished without a trace two weeks later. My aunt, an eccentric but lovable old bird, is obsessed with adventure games, and on her tour she planned to visit as many game sites as she could. However, when she returned home, she was very vague about the details of her trip and seemed distracted by something. She did tell us that she travelled the world starting in Europe from north to south and on to Africa from north to south. Then she visited Asia from west to east and went on to the American continent from north to south. She concluded her journey in Oceania. 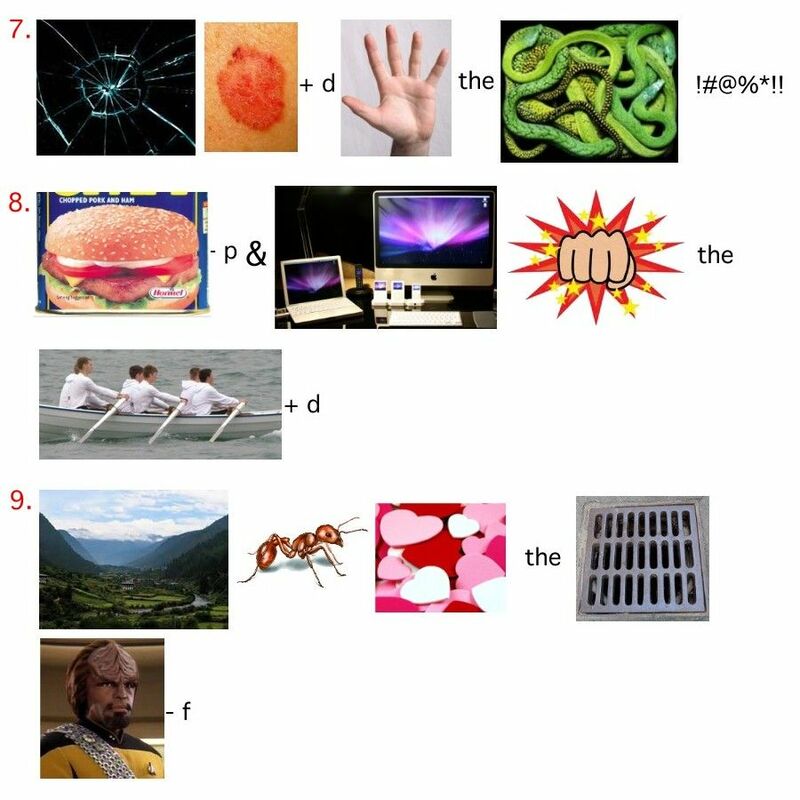 Send the decoded text to Quizmaster and receive 20 points. Ok, ok, I'm getting ahead of myself. She left us some clues. Here are some photographs of the main locations my aunt visited. I'm pretty sure the pictures on these pages are out of order, but that's not important...yet. The notes she wrote next to them don't tell us much, but in most cases they tell whether her destination was the country as a whole or more specifically the city or region. It seems dear Auntie also took souvenirs from all the places she visited, calling them items or objects in her notes. We don't know where she put the actual items, but we do have her inventory list. Unfortunately, she disguised it in the form of a puzzle, so your second task is to find the names of the 16 souvenirs. No item name is shorter than 5 letters, and many are more than one word, so look carefully because a partial answer will be counted as incorrect. The words can be horizontal, vertical, and diagonal as well as backward or forward. A correctly named souvenir will earn you 10, 8 or 6 points for a correct first, second or third guess respectively. This part is worth a maximum of 160 points. Match up the souvenirs with the locations for an additional 5 points per pair and a maximum of 80 points. You get only one guess for each answer in this part. 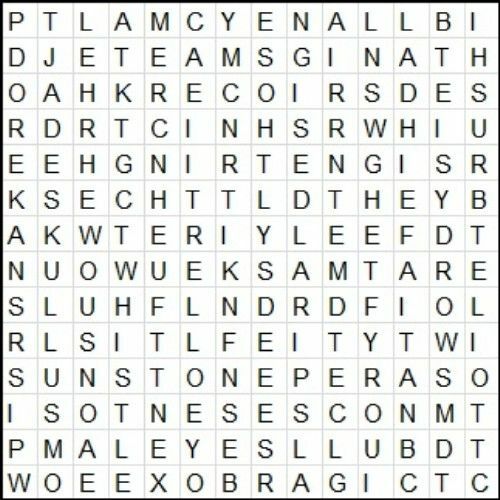 Hidden in the word find puzzle is also a special clue made up of the unused letters. It will give you directions regarding the number code. 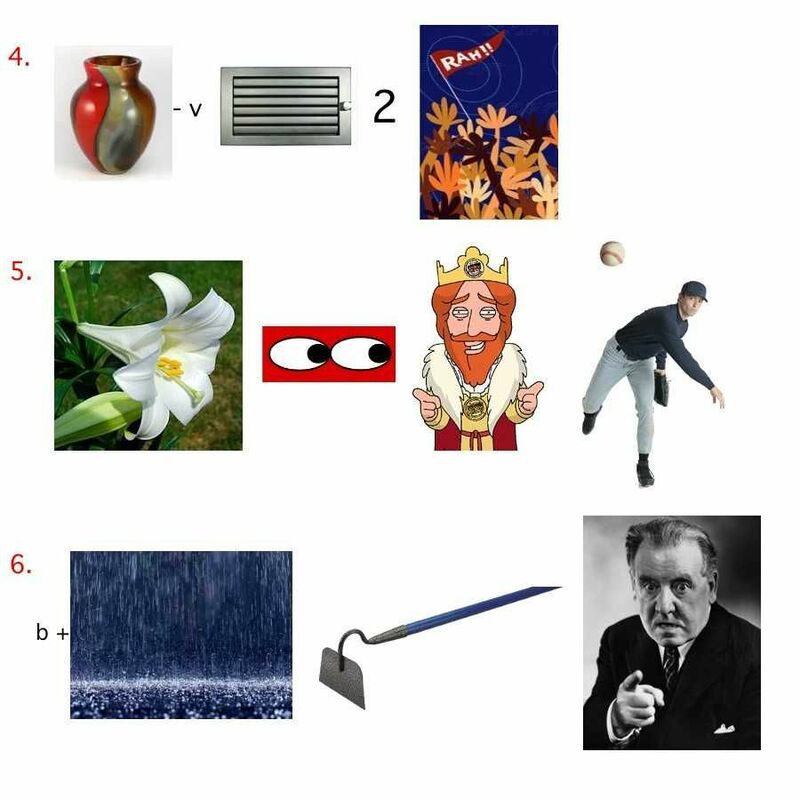 If you decipher this clue, you may submit it for 5 more points. Follow the directions in the word find clue to break the number code. Submit the decoded message for those additional 20 points. Submit your answers to me by 9:00 PM CDT on Saturday, October 11. The maximum number of points you can earn for solving this entire mystery is 425 points. Enjoy your journey! 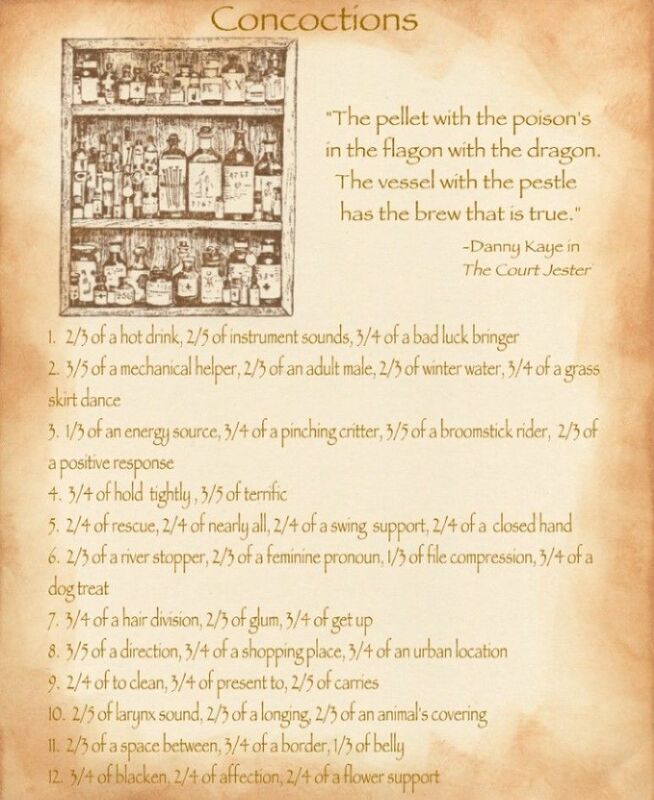 "Place all items in the order in which they were found. First letter is one, second two, etc." "Took Gage's suit. Going to Atlantis with Arthur." 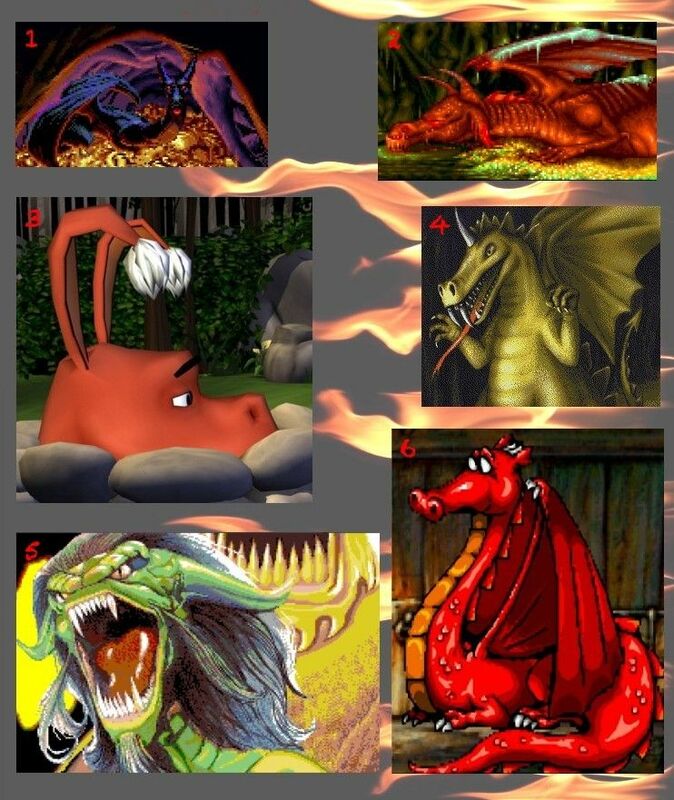 Take a look at these 20 fierce and (mostly) fiery dragons and, without getting too singed, identify in which games they appear. Each one can earn you 10 points for a correct first guess, 8 points for a second, and 6 points for a third. The maximum number of points you can earn for this puzzle is 200. Submit your answers to me by 9:00 PM on Saturday, October 18. By the way, the fire extinguisher is in the hall, if you need it. These 19 anagrams are hot, really hot! 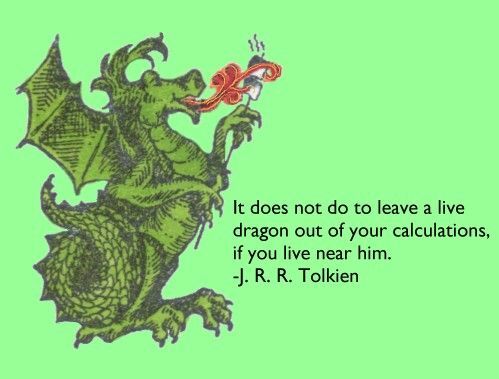 In fact, they're so hot that dragons would adore them. Your task is to unscramble them. The number beside each phrase shows how many words are in that particular answer. Each answer is worth 10 points for a correct first guess, 8 points for a second guess, and 6 points for a third. 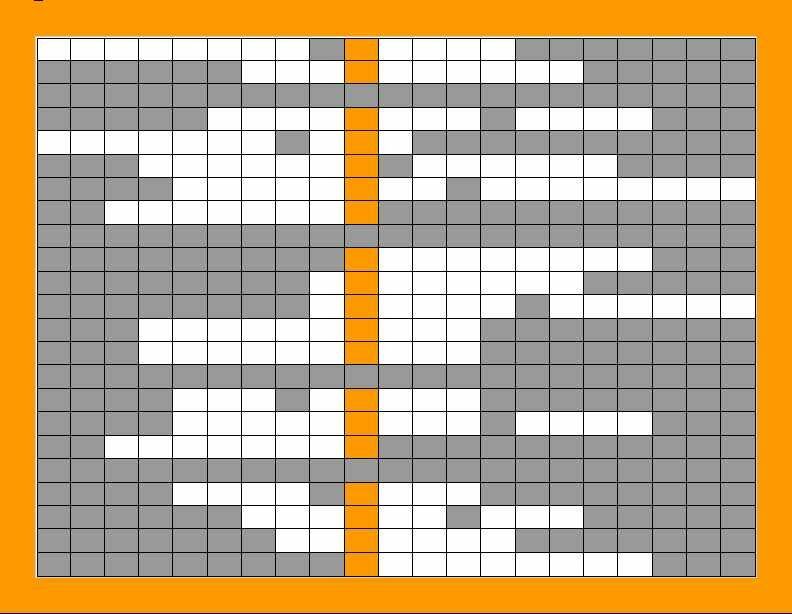 For 15 extra points, put the hot words and phrases horizontally into the grid to reveal an appropriate song title in the colored vertical section. You only get one guess for this one. You can earn up to 205 points for this puzzle, so send your fiery answers to me by 9:00 PM CDT on Saturday, October 18. Oh, no! Here’s another mechanical contraption that isn’t working properly. You adventure gamers know the routine. You finally found the special screwdriver with the strange head and have taken the door off the machine, but now the gears seem to be frozen. A few drops of oil or yak butter or a hit with a sledgehammer usually loosens them up, but not this time! This machine needs words to make it go. Read the 21 clues and write each 6-letter answer on the gear surrounding the corresponding numbered cog. The words can go either clockwise or counter clockwise, and you have to find the place for the first letter yourself. That's not as hard as it sounds because all the answers have two letters in common with the previous and the next gear. To start you off and help you find the right direction, a few letters are already in place. You’ll also notice that each numbered cog has a yellow cog attached to it. 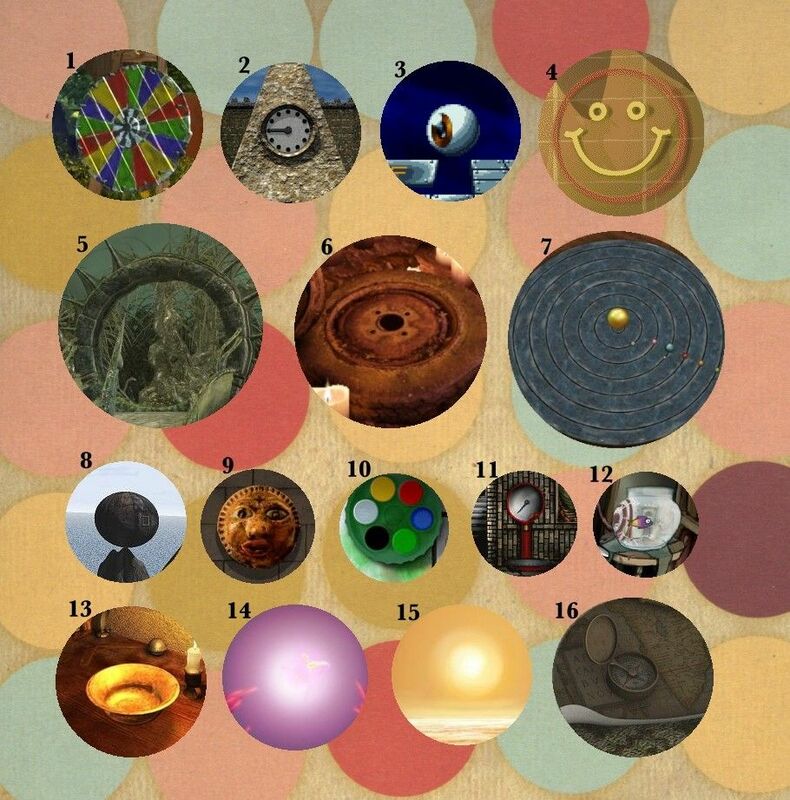 If you have placed all the answers correctly, you can read a question on the yellow cogs from 1 to 11. 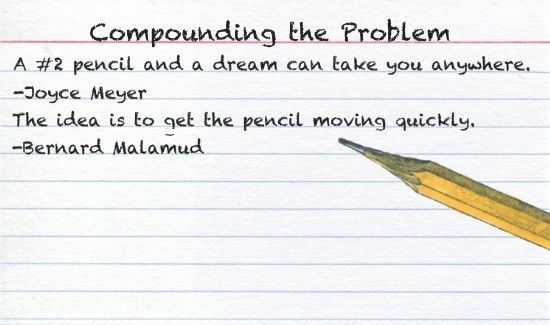 Then, reading from 12 to 21, you will find the answer to that question. The question and answer on the yellow cogs is worth 15 additional points. The maximum number of points for this puzzle is 225. Send your list of answers to me by 9:00 PM on Saturday, October 25. In the meantime, don't beat too hard on the machinery. By the way, there is a gray scale version of this puzzle available. If anyone would prefer it for printing, just let me know. 1. The last name of this peace officer, who's first name is also an American state capital. 2. Home to the assassins, you have to unravel its secrets if you want to kill Simon. 3. Chelsee or Louie, for instance. 4. Play this if you like growing carrots. 5. He uncovered two conspiracies. 6. This, eh, species has several members that you control in a series of four games. 7. Samantha uses this to get the key from Susan. 8. Ad man Mr. Wright goes this long without sound. 9. After this there's still life. 11. She found the tree that gives immortality. 13. Does Nina know this means "of the heart"? 14. Main characteristic of certain invaders. 15. In Anacapri you meet this wise animal. 16. Guybrush starts with three of them. 18. The first case in Sweden. 21. 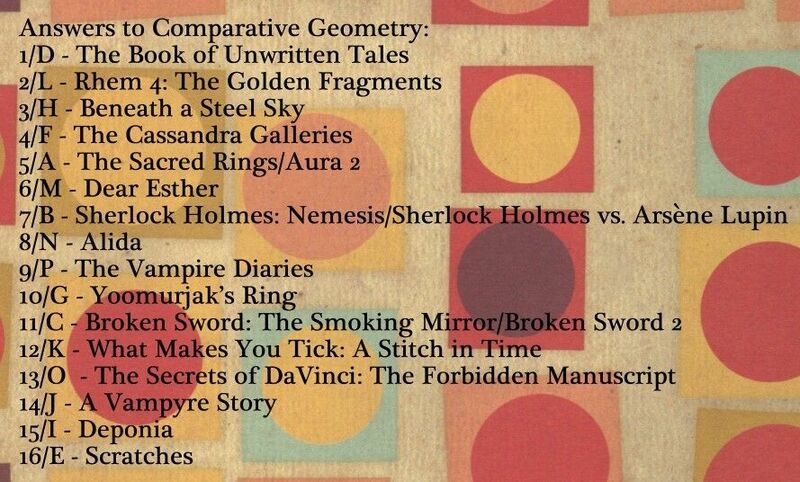 In Syberia, this list has a treble clef and a bass clef. "Want some rye? Course ya do!" Can't shake the feeling that you're being watched? Did the eyes in that painting just move? Is something peering at you from that dark corner? Anything is possible here at Mystery Manor. The letters of the message and the eyes appear on game boxes. 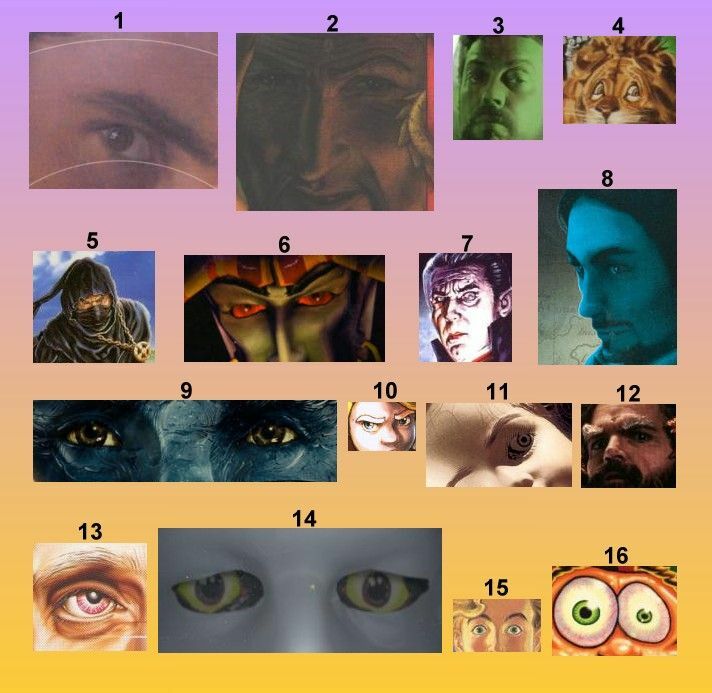 If you can overcome your fear, your task is to match up the letters with those glittering eyes and name the 16 games they represent. When giving an answer for "s" or "th," please tell what word from the message it's in. 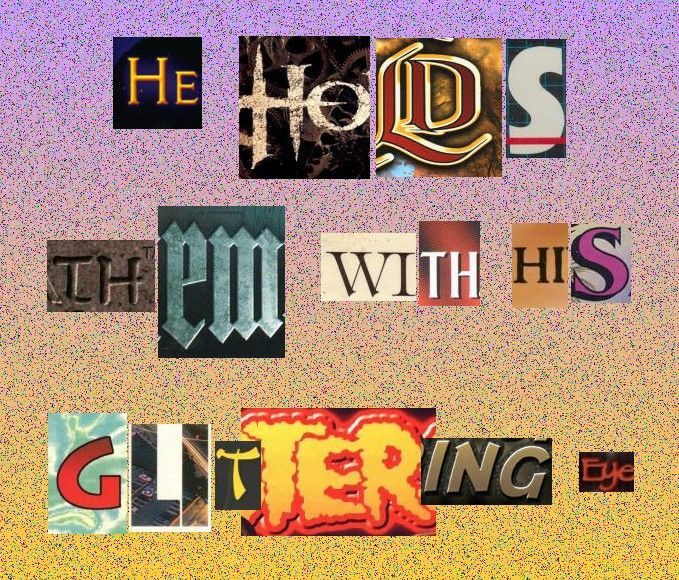 The words for the other letters are not necessary. It will also help with scoring if you submit your answers in numerical order, such as 1X, 2Q, 3Z, etc. You will receive 10 points for a correct first guess, 8 points for a second, and 6 points for a third. The maximum score is 160 points for this puzzle. Solve it as if no one were watching, and send your answers to me by 9:00 PM on Saturday, October 25. 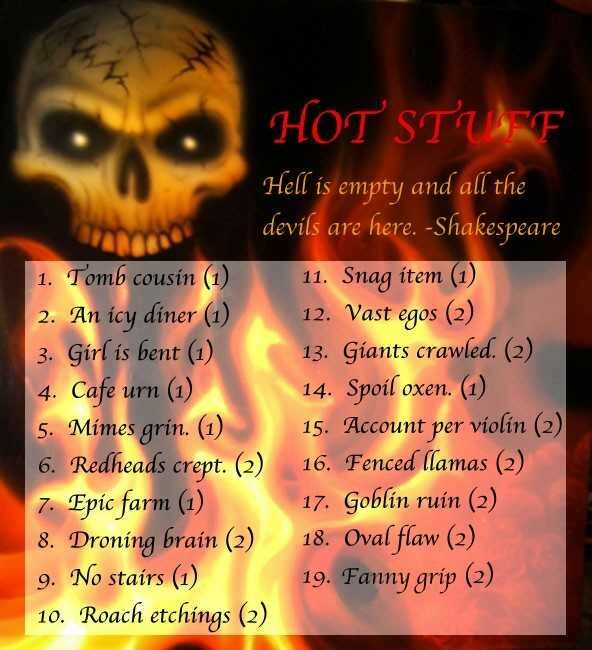 We're having a Halloween party here at Mystery Manor, and my dear wife, Cecy, has set out some snacks for everyone. The guests have arrived, so let's get this celebration rolling! The guests, the bartender, and a couple of stray critters that wandered in come from 20 different adventure games. As you circulate around the room, you have to sort out which character comes from what game. It's not necessary to give a name; just a description of the character and the game title will do. You have 3 chances to guess these, and you'll earn 10 points for a correct first guess, 8 points for a second, and 6 points for a third. Bonus: You may earn an extra 15 points if you can identify the game where the party room is located. You get only one chance to guess it. The maximum points you can earn for this puzzle is 215, so get sociable and send your answers to Quizmaster by 9:00 PM on Saturday, November 1. Cheers! Green alien - Simon the Sorcerer 5: Who’d Even Want Contact?! I've been working hard to prepare for our Halloween celebration, but I'll need some help. 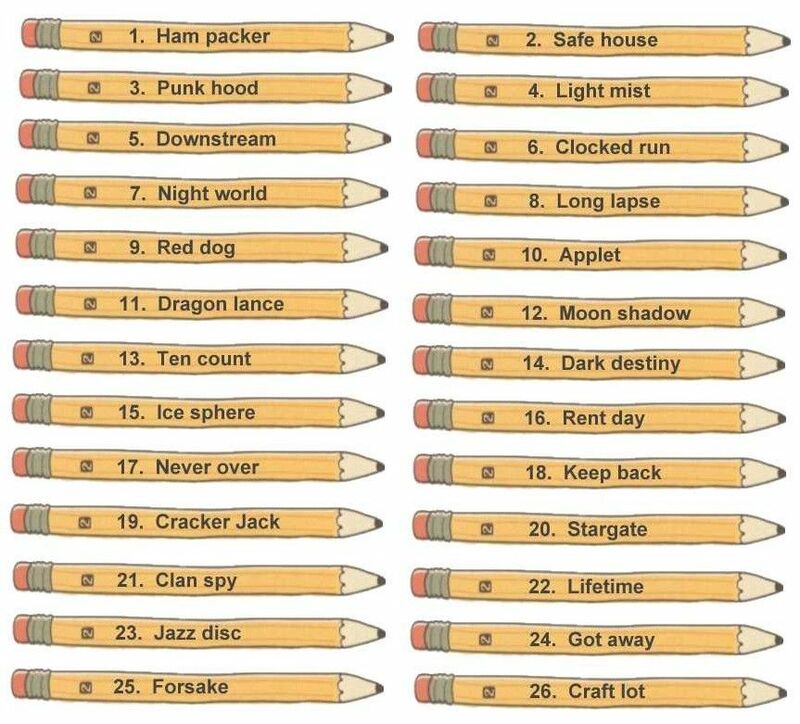 Follow each of these recipes to concoct a game title. Each answer is worth 10 points for a correct first guess, 8 points for a second, and 6 points for a third. The maximum number of points you can earn here is 120. 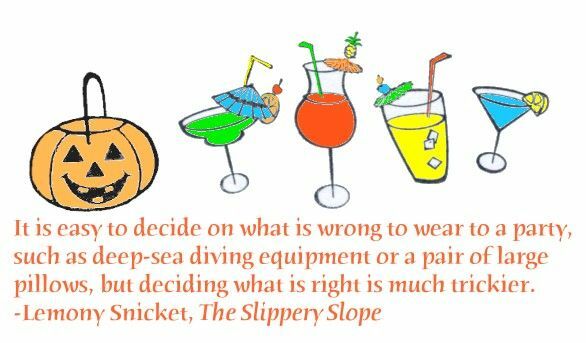 Send your answers to Quizmaster by 9:00 PM CDT on Saturday, November 1. Look at all the pictures I cut out and pasted together! Mombeasty helped me with the letters, and I got yelled at for getting glue on the sofa and the cat, but it's all done now. You have to read the pictures and figure out the 9 games I thought of all by myself. I'm good at reading pictures, and I hope you are, too. They're very tricky, you know, so you get 3 guesses for each one. If they're right the first time, you get 10 points, but the second time you get only 8 and the third only 6. Quizmaster wants you to send your guesses to him by next Saturday, November 1. He says the deadline (don't know what that means but it sounds like fun) is at 9:00 PM Central Daylight Time. Congratulations also Jema and Lucien21 , the winners of our consolation prize drawing! You may choose a downloadable game or a hard copy in that price range. Any reliable game vendors will be considered. If a vendor's shipping rate seems high, we may order your game and ship it to you ourselves, but we'll deal with that on an individual basis. Please PM me with your game choice along with your name and mailing address, if you want a hard copy. If you choose a downloadable game, I'll need your email address. I will post the prizes chosen and the order status here. When you receive your game, please let us know.